December 23, 2013 - Cessna Aircraft celebrates first deliveries of the Citation M2 light jet following Federal Aviation Administration (FAA) type certification. “The Citation M2 is a versatile aircraft that fits many markets and missions, attracting owner-operators looking for an advanced, innovative aircraft of this size, capability, and value. Our launch customer, Stuart Woods, represents this type of customer: owners moving up from their Citation Mustang. 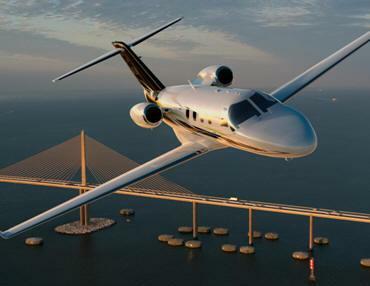 The Citation M2 was announced in September 2011 with a design driven by customer and pilot feedback. First flight of the Citation M2 prototype occurred in March 2012 and the first production unit flew in August 2013. The development and certification process involved more than 150,000 engineering hours and two aircraft flying nearly 1,000 flight test hours and 360,000 nautical miles. The Citation M2 has a maximum cruise speed of 400 knots true airspeed (460 miles per hour) and a range of 1,300 nautical miles. The aircraft can operate at airports with runways as short as 3,250 feet and will climb to 41,000 feet in 24 minutes. The Citation M2 is certified for single-pilot operation and features two Williams FJ44 engines. The aircraft can easily handle non-stop legs such as Houston, Texas-Washington D.C.; Chicago-Miami, Fla.; Frankfurt-Moscow; and Dubai, U.A.E.-Mumbai, India. The M2’s clean cockpit design features Cessna’s proprietary Intrinzic flight deck powered by Garmin G3000 avionics with high resolution multifunction displays and split-screen capability. Touch screen interactivity comparable to a smartphone provides pilots with precise performance information they need in a logical, familiar user interface. From the cockpit divider aft through the rear lavatory, the main passenger cabin of the Citation M2 is 58 inches wide and 11 feet long with a 5-inch dropped aisle providing a cabin height of 57 inches. Eight large windows, roomy adjustable seats and intuitive controls highlight the all-new cabin.